Photographer Edmund Sumner has photographed Yakisugi House (Charcoal House), designed by Japanese architect Terunobu Fujimori. Completed in 2007, the residence is located in Nagano, Japan. It comprises a living and dining area, two bedrooms, a study, and a tea room located in the tower. The building is clad in charred cedar that was smoked in eight-metre lengths. Due to the length of timber used, the material warped during this process and the resulting gaps in the facade are filled with plaster. Terunobu Fujimori, who has been teaching architectural history for years at Tokyo University, likes to draw inspirations from sources as widely removed from contemporary Japan as possible. He came up with the earthy shape of his first project, Jinchokan Moriya Historical Museum, from reading another architect Takamasa Yoshizaka’s description of a mud hut Yoshizaka encountered on his travel through 1940’s Inner Mongolia. For Yakisugi House, it was the small cave dwelling found near the Caves of Lascaux in France Fujimori encountered on his own travel. The cave idea materialised as the main living/dining room area, which leads to a study, two bedrooms and a tearoom inside a mini ‘tower’. 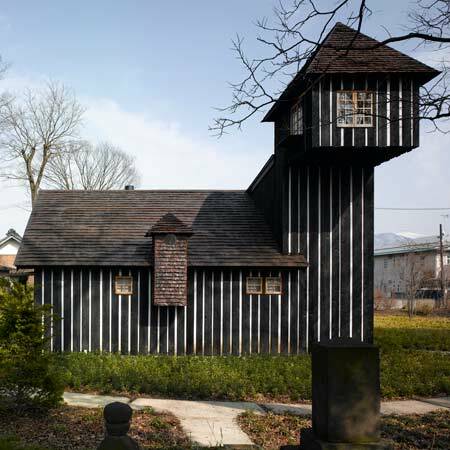 Fujimori wrapped his ‘cave’ with highly durable charred cedar boards; a traditional cladding material still used in Okayama prefecture. Normally, however, the boards come in lengths of less than two metres, for if they are any longer they warp with the heat of their production process. Undeterred, however, the architect persuaded a group of ten friends, including the clients, to spend a whole day charring cedar boards by using a new experimental technique of his own. It took them one whole day to produce four hundred boards, all more or less eight metres tall, which were precariously but beautifully smoked in clusters of three. The inevitable warping of the long charred boards was remedied by filling in the gaps with plaster, creating in the process the striking zebra pattern of the exterior walls. Fujimori also landscaped the generous 1,825 square metres of land, ‘planting’ his ‘green sculpture’ alongside a small hut that serves as a rest house, reviving the old well and redirecting fresh spring water from it through a long bamboo conduit. Finally, he paved the walkways, creating a textured surface by using brush strokes over wet mortar – again, a technique which he developed over years of experimentation. Three tree trunks penetrating through the end of the gently sloping roof appear to have some ritualistic significance, but Fujimori simply wanted to continue on the three supporting columns skywards. From the hand-rolled copper plates covering the roof of the mini tower to ‘bits’ of charcoal stuck, like a swarm of bees, around the stove inside the cave, Fujimori invariably, and sometimes idiosyncratically, confronts the austere ‘international’ language of modern architecture. Kengo Kuma has called it “anti-historical’; one could also call it ‘anti-geographical.’ It would be very difficult indeed to attribute the overall style of Yakisugi House to any specific past or place.